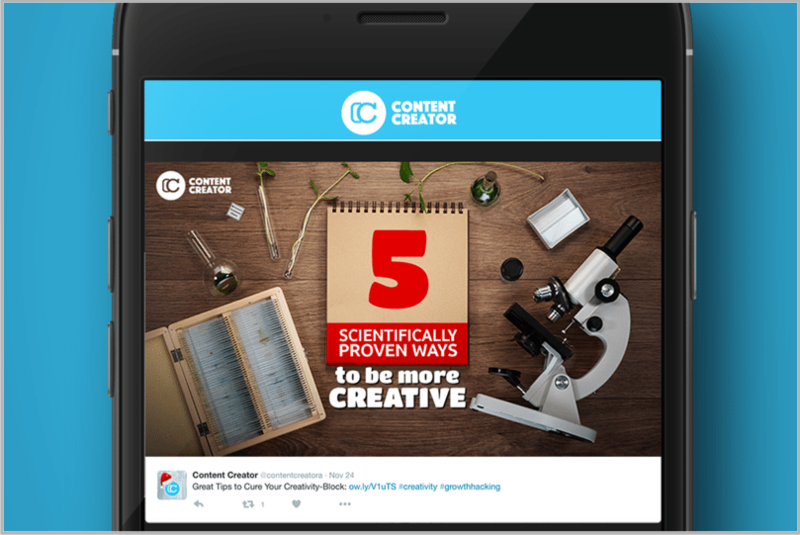 Visual content is a great way to stand out in the never-ending stream of 140-character messages that appear on Twitter – by an overall rate of 6000 per second. It will not only help you to get twice as much vertical space in the timeline, but it will boost your engagement and result in 35% more re-tweets and 18% more click-throughs. Not a bad way to be seen, heard and remembered, right? However, as Twitter, like other social media networks started moving in the direction of promoting visual content, your image will probably be competing against hundreds of other images. In that case, you may want to upgrade the image by combining it with text. That will force users to scroll slowly as it will take them a few extra seconds to read the message on your image. 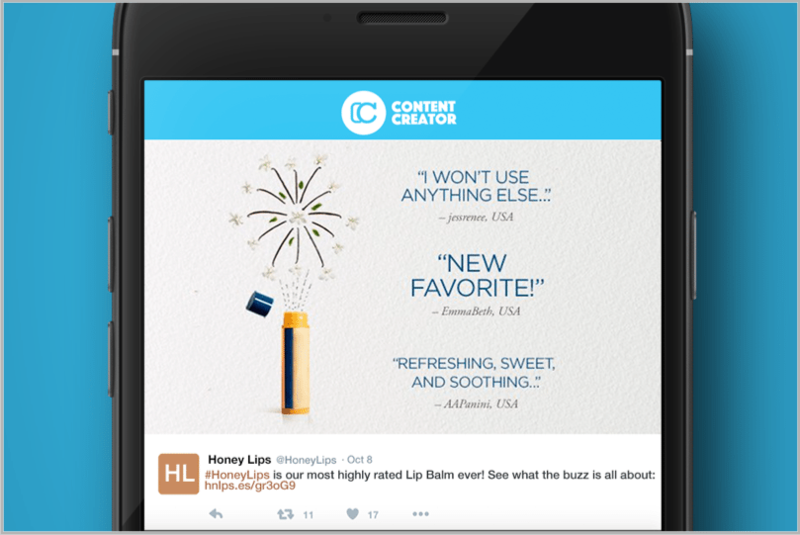 Additionally, text on an image will add context to your tweet copy and allow you to expand your message beyond the mandatory 140 characters. In the past, creating such visual content required professional designers. 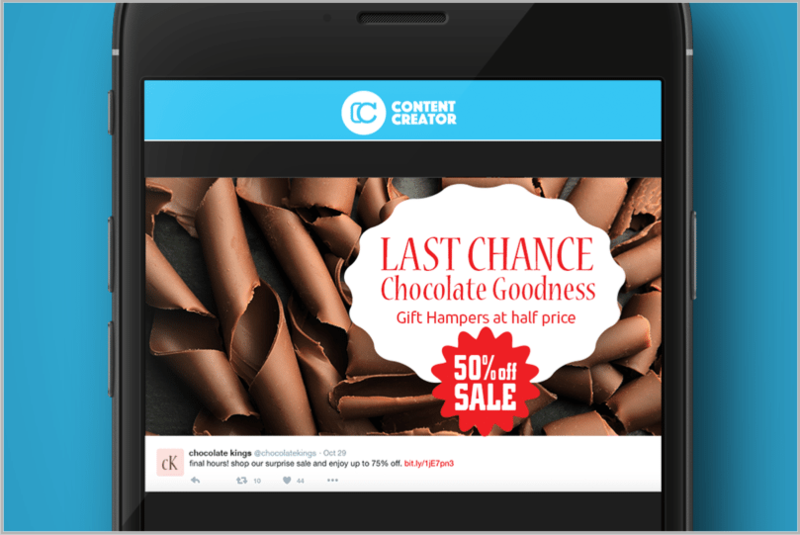 But today with free design applications such as Content Creator you can play with cool text templates, filters or backgrounds and create beautiful designs in no time even if you have no design experience. When the content you are tweeting is important but not picture-worthy, you can still make it attractive by sharing some part of that content in a visual form. It can be a title of your blog, interesting statement from an article or a quote from an interview. Presented in the form of a powerful image, such tweets can encourage viewers to check out the whole content or retweet it and in that way extend its reach. Make sure that your text is short and to the point and that the background image is not too busy or distracting. Remember to stick to two fonts and only go for three if you must. For additional branding place your logo on the image; as tweets travel this will ensure that everyone knows an image is yours, even when it’s retweeted by your followers to the audience that is not familiar with your business. Place the logo in the corner of the photo so that it doesn’t interfere or overburden the image. If you want to turn potentially unentertaining and lengthy information, into an engaging experience that can be easily digested, you should take data and make it visual. That type of information is very compelling as it contributes to the feeling that in doing something you are not alone, but rather a part of a much larger group that shares the same experience. When designing graphs make the most of your brand colors, as their consistent usage will help your viewers instantly recognize your company in the sea of other content. To make sure that the information from your online or in-store promotion reaches your audience, remind them of it with social media. Create focus and make your message stand out by leaving enough white space around it. It will give your design some breathing space and significantly improve readability of your message. Apply the principle of font hierarchy and make words such as “SALE”, “DISCOUNT” or “% OFF” bigger in size. Remaining text should be simple, clean and easy to read, but you can always use a pop of bright colors to make your visual stand out in a subtle way. If you are in a line of work that requires people to make a purchase, you should use testimonials of your existing clients and turn them into quotes. It will give you credibility and show actual benefits of your product to others. The simplest design for this type of quote includes a part of the statement and a photo of a person or your product. Place messages on a simple background and write it at least partially with fonts from the script family, as they add a touch of personality and friendliness to the message. Emphasize certain parts of the message with a different color and in that way focus the attention of viewers to text. 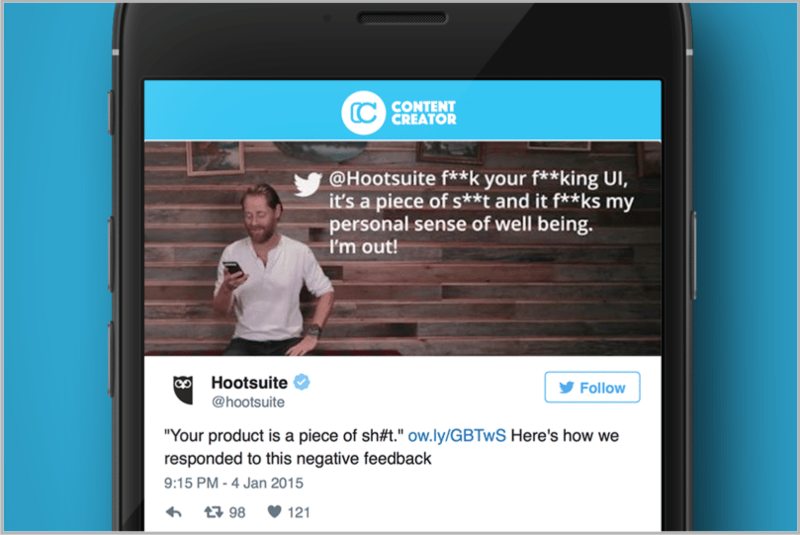 That was a surprising message published by Hootsuite on their Twitter page. The element of shock and surprise is something that has made this one of their most successful tweets ever and the one that has above-average results every time they use it. This is a great example on how you can shake up the audience that is used to a certain tone or content from your tweets, grab their attention and make them stop scrolling. Once they stop it is very likely that they will click on or even retweet. In the end don’t forget that you don’t need to be on Twitter to manually post your visuals. 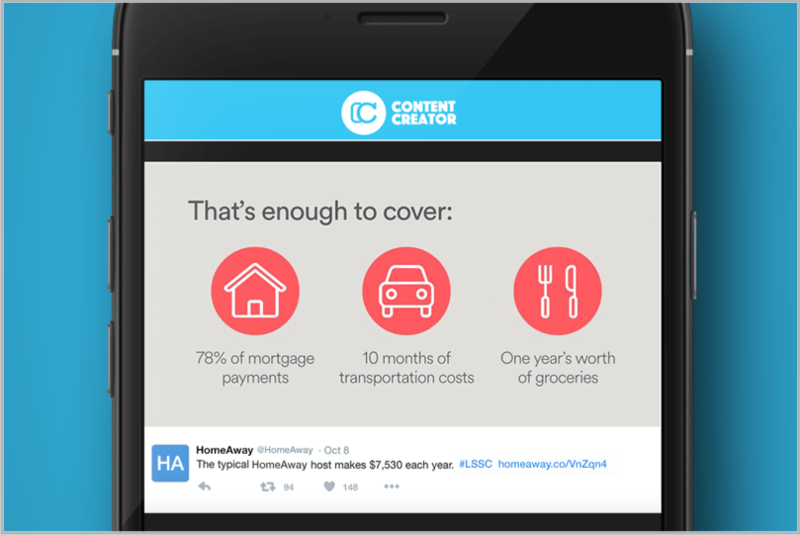 Design applications such as Content Creator also offer a scheduling option so that you can distribute your tweets at optimal times of the day without interrupting your daily schedule. 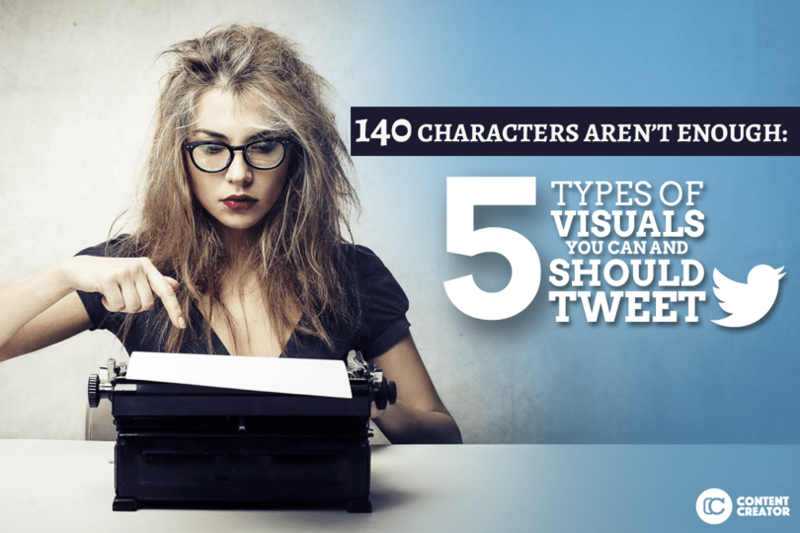 What do you think about the importance of visuals on Twitter? Are you using visuals as a part of your Twitter strategy? Do they provide more engagement?